I would like to introduce two special Dachshunds who are great friends to my family. 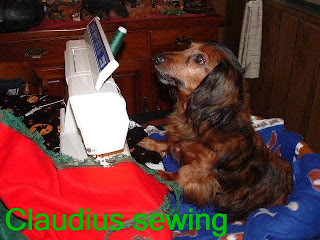 Claudius is the sewing Dachshund. 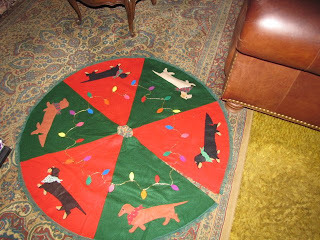 He creates amazing handcrafted Dachshund items, like the Christmas tree skirt and afghan pictured, despite the help of his parrot siblings, Willis and Petrie. 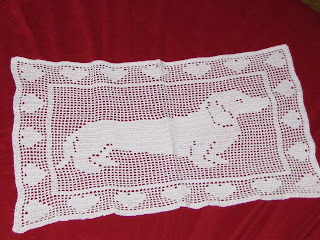 J. R. Ferguson is 21 1/2 years old Dachshund but doesn't have the paperwork to prove his true age. Some of the books for auction are the end of J. R.'s collection as he is no longer actively selling on Ebay.